Inlays and onlays in Delano, CA are custom-crafted porcelain fillings used to restore cracked, broken, decayed, or missing teeth by permanently bonding them to the tooth. They require less tooth enamel removal and are smaller than crowns but bigger and stronger than fillings. They create a seamless repair that is virtually distinguishable from your natural tooth enamel. Inlays and onlays are actually indirect fillings because they’re fabricated in a laboratory and then bonded to the damaged tooth surface during a second dental visit. This is different from direct fillings that are cemented during the first dental visit. Before the procedure, the tooth and surrounding area is numbed using local anesthesia, and sedation may be given to anxious patients. There are two types of inlays/onlays that your dentist can recommend depending on the amount of tooth structure left. 1. Direct inlays and onlays – only one visit required. First, the decay is removed and the tooth shaped. Then, a soft material known as composite resin is put on the tooth and molded to fit the damaged tooth. The inlay is then removed and hardened in a special oven in the dentist’s office, bonded to the tooth, and polished. It may be shaped further to adjust your bite. Advances in technology have made it possible for ceramic inlays/onlays to be fabricated in the office and bonded at the same visit. 2. Indirect inlays and onlays – cemented on second visit. Your dentist starts by removing the decay so they can make an accurate impression of the damaged tooth and adjacent teeth, as well. The impression is sent to a laboratory for fabrication of the inlay/onlay while a temporary filling is in place. 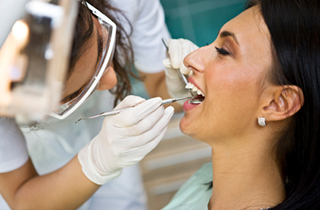 Instead of an impression, some dentists use a machine to capture an image of the prepared tooth. The temporary filling is removed at the second visit, the site cleaned and dried, and the inlay/onlay cemented to the tooth. It is then polished and shaped to fit your bite. Onlays and inlays are used to restore a damaged or decayed tooth to its natural shape, size, and color – if using porcelain. They enhance the function, strength, and appearance of a damaged tooth that may otherwise be lost. Inlays are smaller and typically used to replace the inside biting portion of a tooth (crevices between the cusps) when the healthy structure (pointed parts) remains on the outside biting section of the tooth. Onlays, on the other hand, are larger and used to replace broken cusps or to strengthen compromised areas around the tooth perimeter. Onlays can cover the sides of a tooth, multiple cusps, or even the entire biting surface. Why not just get a direct filling? A large dental filling can weaken the remaining healthy structure of a damaged tooth, causing the tooth to crack, break, or eventually need endodontic treatment. Your bite forces can perpetuate this damage because a direct filling is not strong enough to withstand these forces over time. Dr. Paul Mallouk offers inlays and onlays to his patients in Delano, CA as an affordable method to improve the aesthetic and function of certain teeth. For more information on our services, please contact us @ 661-725-9105 or conveniently fill out our contact form.